The world-class, $375 million, multipurpose entertainment venue, which has a maximum seating capacity of 20,000, is equipped to host large concerts, award shows, basketball, boxing and mixed martial arts, as well as many other major events. Recently, the T-Mobile Arena was host to the UFC event – with Coldplay also stopping off as part of their tour – highlighting the diverse range of functions held at the venue. Overall, the total facility covers approximately 16 acres, so there is plenty of room for up to 150 events that are set to be held at the 650,000 sq ft arena over the next year. 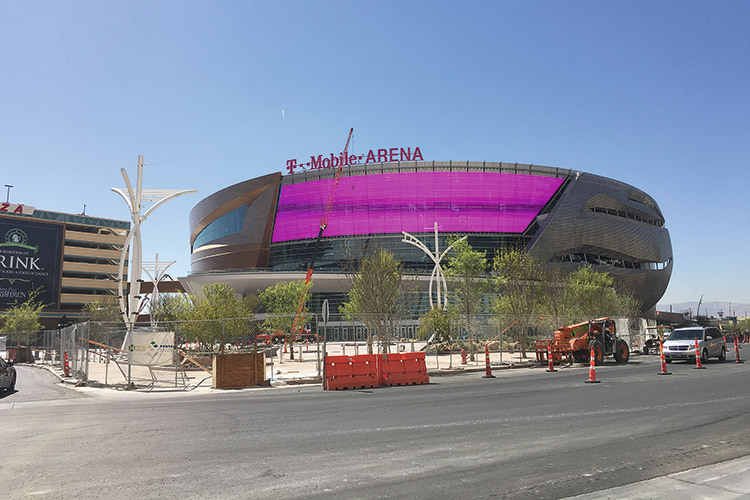 With so much planned, it was vital that everything was in place when the T-Mobile Arena first opened its doors back in April 2016. This included the technical install, with sound, video and lighting playing a huge role in every event at the arena. Michael MacDonald, President of ATK Audiotek, served as a Project Manager for the audio installation inside the arena itself, with his task being to provide the venue with the best possible sound reinforcement coverage and intelligibility. Michael takes up the story: “We were asked by the folks at LVA Corporation to quote an audio system that would meet the consultant specification for the bowl system, but, as well as that, could also be redeployed for portable applications. From there, we began working with Harman Professional Solutions on a system that could meet or even exceed the consultant specification, along with being highly flexible and portable to meet the needs of the production team at T-Mobile Arena. 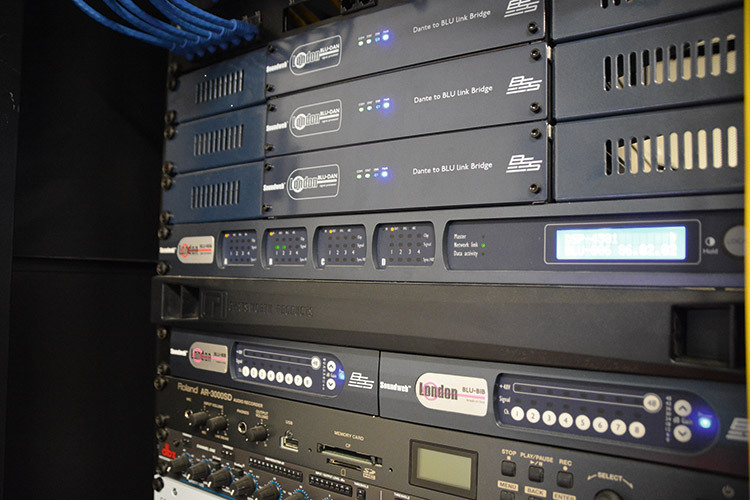 To ensure that the audio install did provide a concert quality, a six-cluster sound system was installed. Designed by Dallas-based consulting firm, WJHW, the clusters consist of 72 JBL VTX V25-II line arrays and 36 JBL VTX S28 subwoofers, all of which are powered by 18 Crown VRack amplifiers. The JBL VTX line array clusters are used as the centerpiece of the whole audio setup, Michael explained why: “Performance, coverage and rider acceptance all drove the decision to go with the JBL VTX V25-II, but in the end, it’s the overall value that is the deciding factor. The VTX V25-II sounds great and has astounding output and bandwidth. To complete the whole package, the system has Crown I-Tech HD amplification with BSS OmniDriveHD V5 processing and JBL HiQnet Performance Manager configuration and control software. The system at the T-Mobile Arena also included cardioid subwoofer arrays that were specifically designed by Scott Bray, a Consultant at WJHW, to direct the infrasonic sound towards the audience and away from the hard walls and the roof structure. VTX S28 subwoofers from JBL, which provide extremely high peak-to-peak excursion capabilities to deliver extended low frequency performance, are used in the venue. 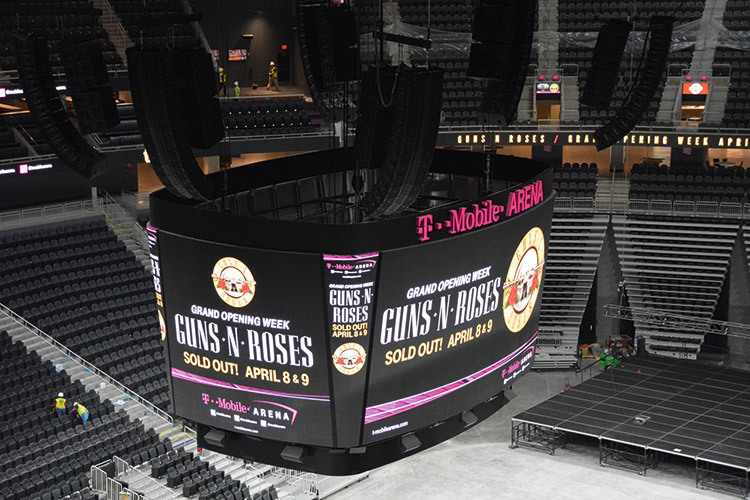 It was established early in the plans for the T-Mobile Arena that the video displays would be a huge part of the venue, so, with that in mind, Daktronics was selected to design, manufacture and install 25 LED video displays in and around the venue. The install includes the very first see-through display in the city – which is also one of the largest in the United States – as well as a central video display, fascia, tunnel entry, scorer’s tables and exterior displays. For the lighting aspect of the T-Mobile Arena install, the venue’s management enlisted the help of 4Wall, a full-service lighting company also based in Las Vegas. 4Wall’s Systems Integrator, Barbara Brenna was initially contacted to bid on the lighting control systems for the T-Mobile Arena. The execution of the project was then led by 4Wall’s Project Manager, Steven Byers, Shaun Ballew, the Senior Drafter and Project Technician, Josh Lentner. For the lighting control system, 4Wall specified the ETC Paradigm due to its versatility and reliability, along with the ETC Echo Relay Panel Feedthrough, which allowed multiple lighting control circuit feeds with one circuit breaker and direct dimming control. 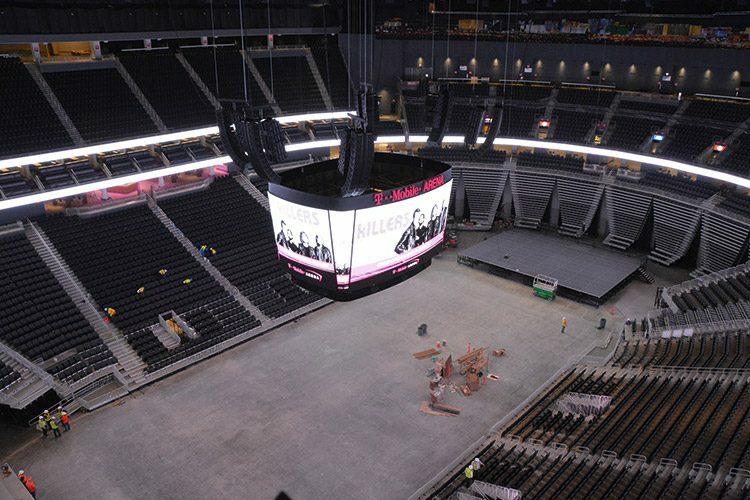 With the lighting control in place, along with the audio and video installations, T-Mobile Arena is more than ready to host a whole range of events, concerts and shows.